Employers have a 1 in 3 chance of being the target of an employment related action for every 100 employees. Private and small companies are even more vulnerable as many have less HR resources, think of themselves as “family”, and generally pay less attention to potential risk areas. In 2012 the EEOC received more complaints than any previous year. They have increased their budget by 20% to increase staff to handle the pure volume of complaints being filed. Regulators have become more aggressive in enforcement at both the federal and local level. 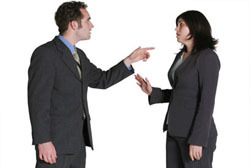 It is important for employers to realize that the EEOC is looking at every charge for a pattern of behavior. A single complaint can easily balloon into a much bigger problem. Recently, St. Mary’s Hospital in Madison, WI agreed to settle a class action lawsuit alleging that the hospital failed to pay 1,400 nurses for meal breaks when they had to stay at the hospital on call. In the broad context of wage and hour issues, allegations include misclassification of employees as exempt to avoid overtime pay (i.e. sales personnel), not paying for the time spent donning or removing of gear, booting up computers, preparing for the work day, etc.. and the use of mobile devices to access voice mail or email off hours without compensation. The 4th district Court Appeals ruled recently that Tyson Foods must pay back wages for the time spent putting on and taking off gear that can include hair nets, hard hats, shoe covers, safety glasses and frocks. The back wages could top more than $1 million. Looking into the future, employers should be aware of the potential claims concerning obesity and corporate wellness programs. The American Medical Association recently classified obesity as a disease. Is this a precursor to becoming a protected class? The challenge for employers is being able to show that an applicant or employee cannot perform the job duties rather than the impact that an obese person can have on health insurance, sick time, and productivity. With regard to wellness programs employers are advised to be careful that individual’s privacy is protected, that they are not being judged /monitored and that employment decisions are not being influenced by an employee opting out of participation or following recommendations. The average cost to defend against an employment action brought by a single plaintiff that is ultimately dismissed is $150,000. Costs for complex and class actions can skyrocket and have a huge financial impact to any employer regardless of industry. Employment Practices Liability insurance should be a part of the insurance program for all employers. Taking time to understand the policy, the obligations of both the employer and carrier, and what to do in the event of a claim is time well spent. Odds of becoming the target of an employment action are on the rise. For more information about Employment Practices Liability Insurance for your Wisconsin company, contact a knowledgebroker.